We have had some glorious weather over the past week or so but it is becoming quite autumnal. When I was walking up to the woods one morning I saw (and heard) the first skein of geese overhead: I always feel these migrating geese are an evocative marker for this time of year. I’ve also today seen some fieldfares attacking the rowan berries! 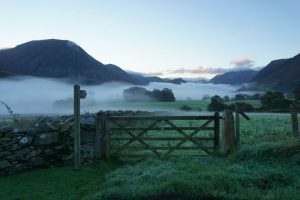 The view towards the lake has been amazing particularly in the early morning when there has often been low level mist. Walking on these early autumn days is very special. 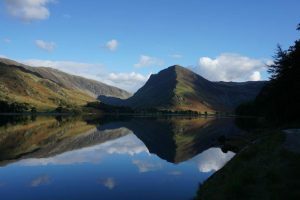 Last Sunday I was on the High Stile Ridge, one of my favourites, the reflections on Buttermere remained there all day. 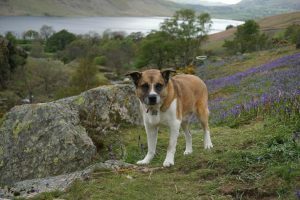 Several visitors to the Cottages this year say they have enjoyed visiting the café at Lingholm on the far side of Derwentwater where Beatrix Potter used to go for holidays when she was young so I thought I had better investigate! 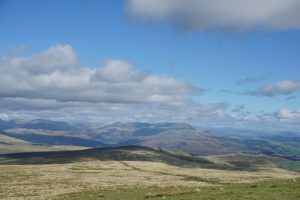 You can make a nice gentle day of it taking a launch over from Keswick and incorporating a walk as far as you wish along the lakeshore returning by boat from wherever you wish. The coffee and cakes were good as well! And it is dog friendly! 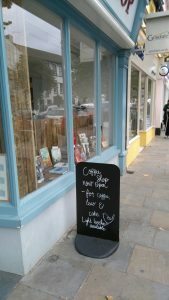 While on the subject of cafes, it is so good to have The New Book Shop in Cockermouth back home: good to browse the books with a coffee stop! For those of you who know me I have to tell you that Wattie died this week. It’s hard to lose your best four legged friend, they leave pawprints on your heart.